Showing 12 articles from July 11, 2014. Summer has kicked off and with it is the Weekend Market on the Dock in South Bend. The Weekend Market starts at 10 am Saturday and Sunday and ends each day around 4 pm, and will happen every weekend until labor day. While spending Christmas in Germany in 2011, some friends and I had the opportunity to visit Dachau Concentration Camp, near Munich. Visiting the camp was an unforgettable experience. Bustling, energetic, crowded, historic, passionate, vibrant – all these words can be used to describe Naples, Italy. But more than anything, Naples is beautiful. Can you recommend some good ergonomic gardening gear for seniors? My 72-year-old mother loves to work in the garden, but has been plagued by various gardening injuries this year. We are asking your readers to support Lisa Ayres to be re-elected for a second term as Commissioner of Pacific County, District No. 3. Election time is coming as one can tell by all the candidate’s campaign signs that are posted all over the county. Ever wonder why we don’t see more alongside the road? The State, the County and the cities have wisely disallowed any campaign signs in any of those right-of-ways. Thank you! In the article “Oyster Shack Reopening in South Bend,” from the July 9, 2014 publication of the Willapa Harbor herald, two items are in need of correction. Gail Friedlander and Paul Young had no idea, when they decided to offer a $500 matching grant to raise money for HAVA's Frisky Fund, how wildly successful it would be. An astonishing total of $1,075 was raised in private donations. In addition, the South Bend Elementary Booster Club donated $300 to the grant - proceeds from their annual Christmas Store. 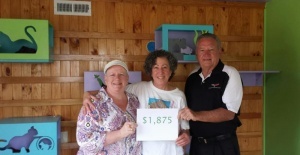 Add in Gail and Paul's $500 and the total infusion of money into the Frisky Fund was a whopping $1,875. The Frisky Fund provides emergency medical care for stray animals in need, and the funds are depleted on a regular basis. THANK YOU to the many community members who contributed to the success of this Matching Grant. If they could speak, the animals you help with your generosity would thank you as well.